Iconic poet and struggle veteran Dr Mongane Wally Serote will recall his experience of ‘Weaponizing Words for Political Change’ at the ACT| UJ Creative Conference. The ACT|UJ Creative Conference is pleased to announce that the #CreativeUprising programme will include a free session, during which Dr Serote will deliver a thought provoking address. The session will take place in the Main Theatre at Arts Centre located on the University of Johannesburg’s Kingsway Campus in Auckland Park. This open session, scheduled to take place from 16h00 – 19h30 on Thursday 27 July 2017, will comprise two parts. The Lekgotla starting promptly at 16h00 will feature The Department of Basic Education and The Department of Arts and Culture. Audience members are invited to bring their questions to this forum, followed by a short break after which Dr Serote will deliver the day’s closing address. Dr Serote is no stranger to t he Arts & Culture Trust (ACT). 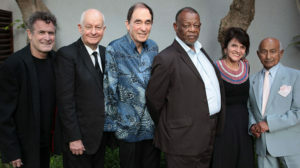 In 2016, he was awarded a Lifetime Achievement Award for Literature at the 19th Annual ACT Awards, The ACT Lifetime Achievement Awards seek to honour South African greats whose continued work in their respective fields have significantly shaped and changed the arts and culture industry in South Africa. Last year, Serote was celebrated alongside Penny Siopis (Visual Art), Johaar Mosaval (Dance), Adv. Albie Sachs (Arts Advocacy), Johnny Clegg (Music) and Pieter Dirk-Uys (Theatre). Dr Serote is a true South African icon, and his work is widely recognised from near and far. Although, best known for his poetry that has been hailed as pivotal to the rise of the Black Consciousness Movement in South Africa, Serote has received numerous other awards, scholarships and accolades. Dr Serote is also an active member of the Liberation Army, Umkhonto We Sizwe and he firmly believes that now is the time that South African literature should feature more heavily in South African curriculums at both school and university level. He says that “arts and culture can be the tapestry which weaves our nation together”. The #CreativeUprising conference is presented by the Arts & Culture Trust (ACT) and UJ Arts & Culture (a division of FADA) in partnership with SAMRO Foundation with support from Drama for Life. The Arts & Culture Trust (ACT) is South Africa’s premier independent arts funding and development agency. The primary aim of ACT is to increase the amount of funding available for arts and culture initiatives, and to apply these funds to innovative, sustainable projects that make a meaningful contribution to society. Through structured funding programmes, ACT provides support for all expressions of arts and culture, including literature, music, visual art, theatre and dance, and the support extends to festivals, community arts initiatives, arts management, arts education and arts administration. Follow ACT online at www.act.org.za or on Twitter or like the Trust’s Facebook page. UJ Arts & Culture, a division of the Faculty of Art, Design & Architecture (FADA), produces and presents world-class student and professional arts programmes aligned to the UJ vision of an international university of choice, anchored in Africa, dynamically shaping the future. A robust range of arts platforms are offered on all four UJ campuses for students, staff, alumni and the general public to experience and engage with emerging and established Pan-African and international artists drawn from the full spectrum of the arts. For regular updates, follow UJ Arts & Culture on Twitter, Facebook or visit www.uj.ac.za/arts. SAMRO Foundation (NPC) is the Corporate Social Investment Portfolio of the SAMRO Group of Companies. As a non-profit company, the SAMRO Foundation aims to promote the national arts through sponsorships of various kinds, and to encourage excellence in the arts through education, facilitation of economic participation in the creative economy, influencing cultural and arts policies by means of research and advocacy as well as promoting living cultural heritage. For more information, please click www.samrofoundation.org.za.